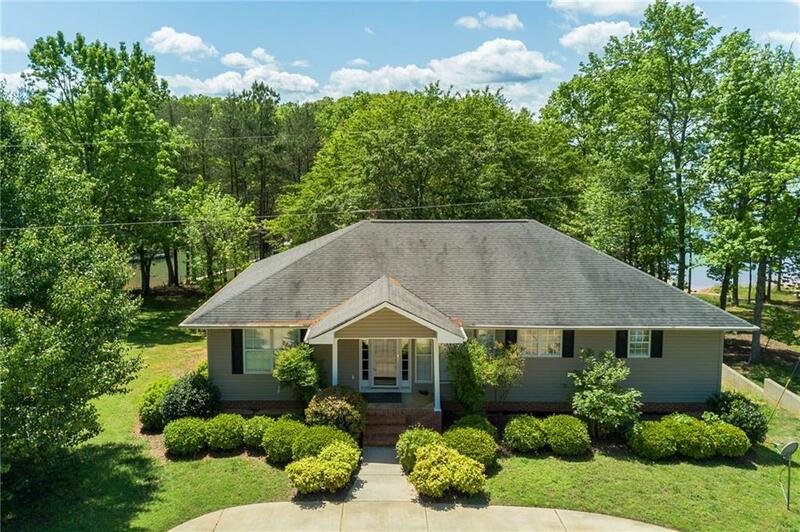 This home is situated on a rare LEVEL Lake Hartwell waterfront lot! With a total of 2622 square feet of finished living space, you can host plenty of guests without worrying that you don't have the space. The main level features a cathedral ceiling and open kitchen and dining area, along with a great room that leads out to a 200 sq ft lakeside screened porch. Also on this level are 3 bedrooms, including a large master, which has a walk-in closet and full bathroom with double sinks, corner jetted tub, and walk-in shower. The finished lower level includes a spacious rec room and two additional bedrooms. A covered patio leads you right to the concrete path to your dock. Vinyl siding and a low maintenance yard make this a great option for those looking for a second home! This is a great lake location close to Big Water Marina and the Hartwell Dam, and only 12 miles from the town of Hartwell.